BBC One has announced two new commissions of adaptations of Agatha Christie's books. And Then There Were None will be adapted by Sarah Phelps in a new telling of this dark and gripping tale of ten strangers marooned on an island. Partners in Crime will see crime-fighting duo Tommy and Tuppence return to the screen in a 1950s era six-part adventure thriller series, starring David Walliams as Tommy. The first three episodes will be an adaptation of The Secret Adversary written by Zinnie Harris, with writer Claire Wilson adapting N or M, which will form the rest of the series. "And Then There Were None is Agatha Christie's masterpiece, a brilliant, unsettling, forensically precise psychological thriller about guilt and paranoia, crime and punishment," said Sarah Phelps. "It is as sharp as a scalpel, as gripping as a steadily tightening noose, its darkness interspersed with the blackest of black wit. I am thrilled to be working on this and very excited to be bringing it to the small screen and to audiences both familiar with and totally new to Agatha Christie's unique vision." David Walliams added, "In bringing these thrilling stories to the screen, it is our ambition for Tommy and Tuppence to finally take their rightful place alongside Poirot and Marple as iconic Agatha Christie characters. I was first drawn to the delicious notion of a married couple solving crimes together, and the more I read of the Tommy and Tuppence novels and short stories I realised they are among Christie's very best work." 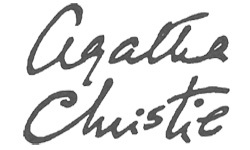 Mathew Prichard, Chairman of Agatha Christie Limited and grandson of Agatha Christie, said: "It is fantastic that, in her all-important 125th anniversary year, my grandmother is to be welcomed with such enthusiasm to the BBC: a wonderful new home for her much-loved characters and their stories, and one which she would be delighted with. The commitment to these productions from all those involved is great to see, and I've no doubt will result in compelling new adaptations, to be enjoyed by fans old and new."